I never had a fancy dollhouse as a kid but I remember going to the local craft store and gazing longingly at all the tiny, meticulous dollhouse accoutrement. I never wanted the dolls but I was enamored of the tiny jars of "coffee," miniature books and tiny potted plants. 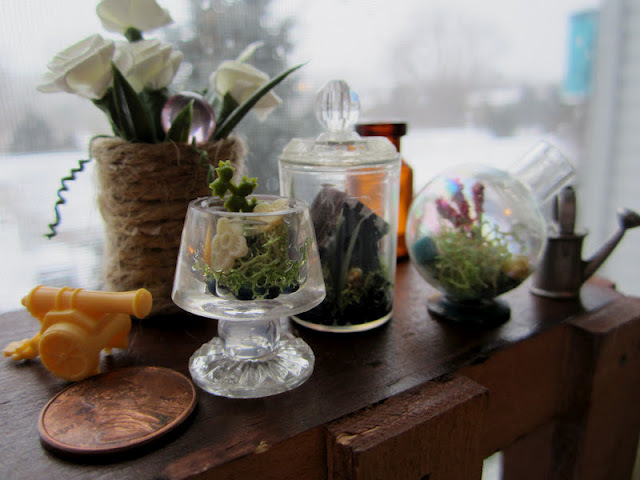 Check out Heather's lovely DIY guide on these adorable doll-sized terrariums at http://shadesoftangerine.blogspot.com/. I love the idea and it's certainly something I've never seen before!